Bosch Munitech, part of Bosch Holdings, has extended its construction services to now incorporate irrigation systems and other water related solutions, including borehole drilling and the installation of borehole pumps. “The company plays an important role in the development of agriculture in South Africa by working closely with the Government to support emerging and community farmers,” says Conrad Adendorff, mechanical specialist, Bosch Munitech. “One of our flagship projects was the Clanso Irrigation Scheme, near Empangeni on KwaZulu Natal’s north coast. The Munitech team worked closely with the Department of Rural Development and Land Reform and emerging farmers in the area to install a system for the irrigation of sugar cane and vegetables. This project comprised the construction of a river abstraction point, booster pump station, bulk reticulation, 2 Ml lined steel reservoir and a drag line irrigation system. A single centre pivot irrigation installation and pump station refurbishment project was completed for the Agricultural Development Agency in KwaZulu-Natal. 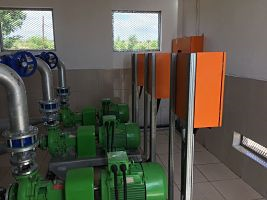 Bosch Munitech was commissioned by the Department of Rural Development and Land Reform in Limpopo for the green-fields construction of a pump station and a three centre pivot irrigation system for the Moutse irrigation project in Groblersdal. Advantages of utilising centre pivots as a means of irrigation include a lower inlet pressure and therefore reduced pumping costs; low maintenance requirements and easy system management. Modern sprinkler packages ensure minimal evaporation and excellent uniformity of water application.